Lately I have read many articles and interesting posts regarding the museum experience and how museum policies affect it. There are many different arguments regarding photography and even sketching in museums. These rules vary from museum to museum and even from show to show. The arguments for "No Photo" policies include copyright and licensing issues, concerns regarding flash photography, discomfort from fellow museum-goers, and issues of control over marketing and public image. Regardless, I am of the belief that a museum should do its best to remain a learning institution and its policies should reflect such and adapt to current conditions of learning. That is, so long as the safety and condition of the work of art is not compromised. Nina Simone from Museum 2.0 actually took the time to deconstruct this issue onto a well thought out post on her blog. Make sure to read it, she really digs deep into this. I agree with Nina and think museums should loosen up a bit sometimes. Also, my good friend and Illustrator Gant Powell posted a while on his blog about an unfortunate experience he had at the Philadelphia Museum of Art. He was forbidden to use his sketchbook inside the museum; in response to that, he wrote a fantastic letter to the museum which he also posted here. Finally, I read this article in the New York Times a while back. It is sort of related to this topic in that it addresses the issue of museum visitors using their cameras. However it focuses less on the policies and more on the experience itself. It is a fascinating article nonetheless- it discusses today's culture and the use of technology as a means of experience. The author argues that many museum-goers today visit museums not necessarily to look at the art, but rather to photograph it. At the Louvre, for example, the thrill of seeing the Mona Lisa has been replaced by the thrill of taking a picture of it. 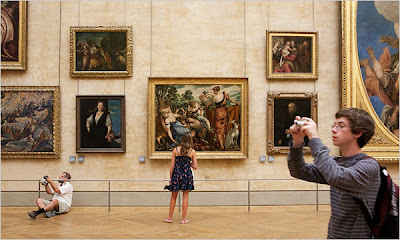 It seems like so many visitors get so caught up in photographing the art, that they forget to look at it. 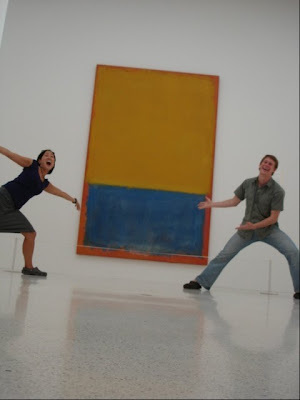 Plus, if no photography is allowed then this awesome blog wouldn't exist: Jumping in Art Museums.